The Rockafeller Center is home to a number of late-night talk shows, so following our descent we wandered through the NBC studios where Jimmy Fallon was playing host to Blake Shelton and Kit Harrington for the evening. 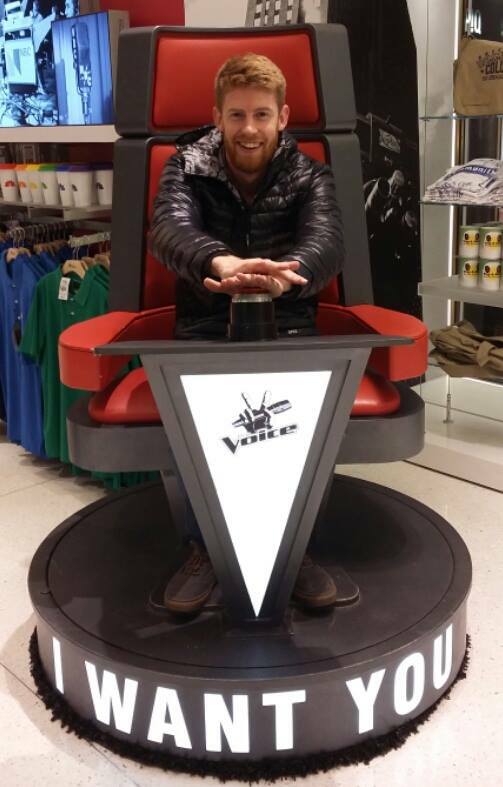 Unfortunately I didn't manage to meet the man who is one of my country music heroes, but I did manage to press the button of Blake's replica judges' chair from The Voice. When I told my friend Carly I was going to New York, she said that there was one thing I had to do. More than anything else, including going to a Broadway show or visiting the Statue of Liberty, I needed to get some street-vendor falafel. I'd initially frowned back at the beaming face on the other end of my Skype conversation, but she remained so steadfast that by the time I'd landed the seed had been firmly planted. "What floor are you going to?" my brother asked the short, tanned, 30 year old, beauty squeezed in beside us. "34 please," she replied with a pearly-white smile. "Where are you guys from? Your accent is so cool." "Scotland," said my brother. "What about yourself?" "L.A. Can you understand me OK? Because I can only just make out what you guys are saying." "Yeah we can, but from experience most people from L.A. aren't worth listening to anyway," I joked. "I'm not even going to try and defend myself," she giggled. "My city is full of air-heads." "Well this is our stop," I smirked. "It was nice meeting you." "Enjoy the rest of your trip!" she winked.